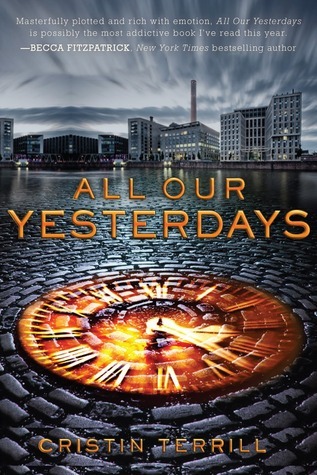 Good Choice Reading: All Our Yesterdays by Cristin Terrill Official Book Trailer & #Giveaway! All Our Yesterdays by Cristin Terrill Official Book Trailer & #Giveaway! My very good friend Casey @ DarkReaders got the opportunity to create a book trailer for ALL OUR YESTERDAYS by Cristin Terrill. I am so happy for her and the trailer came out AMAZING!! She is very talented and they couldn't have picked anyone better! I am happy to share the OFFICIAL BOOK TRAILER for ALL OUR YESTERDAYS created by THE BITTER PRODUCTIONS, right here on GCREADING! Win an ARC Copy of ALL OUR YESTERDAYS! Just leave a comment below telling us your thoughts on the book trailer, and your e-mail address so we can reach you if you should win. ENDS one week from today! That trailer really makes me want to read this one even more than I already did. Umm. Wow. Now that I watched that trailer, I HAVE to read the book. Also, why is this not a tv show or movie, yet? The trailer is great, it gives you all you need to know while making sure you are still wanting more. I love it! Hmmm interesting! The music is not quite the best fit for me, but other than that I liked it. Really looking forward to reading AOY. The trailer was EPIC! I thought the music was great too. Cannot wait to read this!! Wow, loved the trailer and now I'm very intrigued to read the book and find out the whole story. Awesome trailer love it this book looks and sounds awesome have to check it out! thanks for the great givaway! I loved the trailer and enjoyed hearing the band. That girl sure causes a lot of trouble. Please enter me. Thanks! I don't like many book trailers, but this one def did the job and got me even more excited to read this! Liked the music too. That trailer really makes me want to read this book. Loved the trailer, it was amazing! What an exciting read this is going to be. I loved the music and the last half of the trailer, it was really good! The first half though i thought the cutting of the different scenes lokked a little weird and out of timing or something .. But really, perfect choice of music! spittzz(a)hotmail.com - exchange the (a) with a @ ofc ..
i love the book's blurb...can't wait to read ALL OUR YESTERDAYS..
how i love dystopian book!!! thx u so much for the chance to win.. I loved the trailer. So heartbreaking. I'm going to start reading this book as soon as possible! Already added to my desperation of wanting to read this! Love the trailer! And i really want to read this book! It's amazing! I have heard only praises for this book all over the book blogging world and after reading the plot I too am interested in reading this book! The trailer is fantabulous! The music in the background is amazing ! I would love to win this book! Sudha- The music made it look epic and the words described it perfectly. Love it and can't wait to read it! sorry this is my email. Captivating trailer. It's a clear express of the book. Would like to read All Our Yesterdays. This trailer is so intense! Now I can't wait to know more about the story. I can't wait to read this book. The trailer looks great. Oh God that was amazing! Book trailers are hit or miss for me, but WOW. Loved the song choice too!